Many musicians put their soul into their music, and it’s only appropriate that this energy be carried over to their website. While this is an artists chance to put their best foot forward and get viewers interested in their music, they should tread lightly when it comes to flash-based websites, splash pages, and music that starts automatically. These things get in the way of an intuitive user experience, and should be avoided. What Should The Website Include? Obviously, a musician’s website shouldn’t be relegated to listening to the latest tracks and purchasing albums. 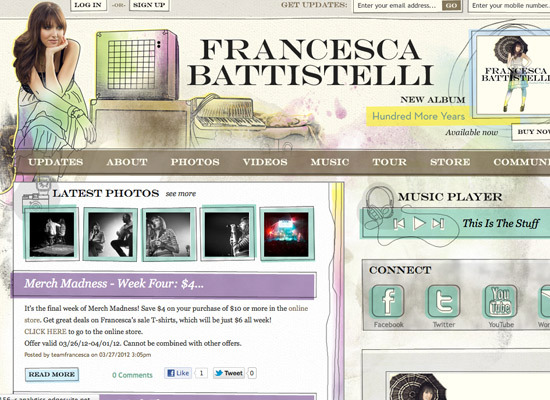 A musician’s website should be designed to generate new fans and keep existing fans engaged. It’s also a good idea for musicians to stay active on social networks like Facebook, Twitter, and Last.FM. This allows fans to receive a behind the scenes look. 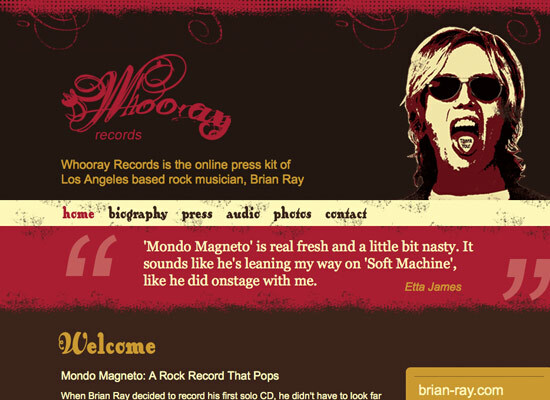 Let’s take a look at 20 musician websites that are doing it the right way. A level of visual interest is achieved on the website for Plants and Animals, using a photographic background and bold typographic links. Notice the ability to view photos, subscribe and “listen to tunes” all of which keep website visitors engaged in the website. 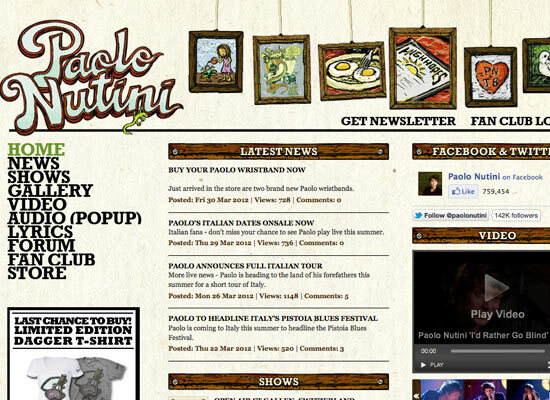 Paolo Nutini’s music is matched with a rather unique, slightly “vintage” style look. It’s made much more appealing by the use of illustrated typography and hanging frames which are brought to life by being different sizes and unaligned. A forum adds a level of social interaction between fans on this website. A storefront selling the band’s schwag creates an additional revenue stream and increases loyalty. 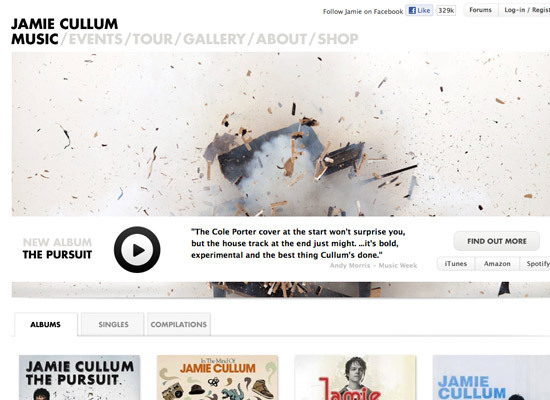 Jamie Cullum takes a simplistic, modern approach to his website. The design is elegant, easy to view and navigate, and incorporates some lovely typography and sleek silver buttons in the top right hand corner. Minimalistic websites are still a popular trend in web design, and a great option for those who want viewers to focus on information instead of the design. A simple grid-based layout and intuitive navigation works well for the singer, songwriter, and producer Bruno Mars, allowing you to gain quick access to important information and stay up to date via links to social networks. 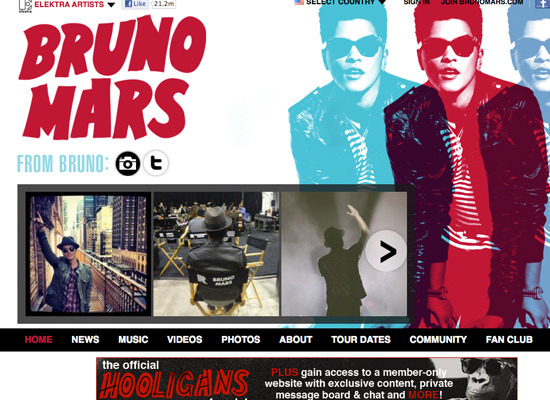 Lots of multimedia on this site, which creates a feeling of being at a Bruno Mars show. Illustration can help set the mood of the design, and help suggest what type of music the artist produces. The watercolor effect, along with a neutral color palette, creates a warm, inviting feeling for this artists website, and gives you an indication of their style of music. Social media is prevalent on this website with the ability to connect with the artist on Facebook, Twitter and YouTube. Large typography is a popular trend in modern web design, and is utilized on the Love, Detroit website. It commands attention and is often the first thing we look at when entering a site, and has the power to convey to mood and feeling of music which it’s promoting. 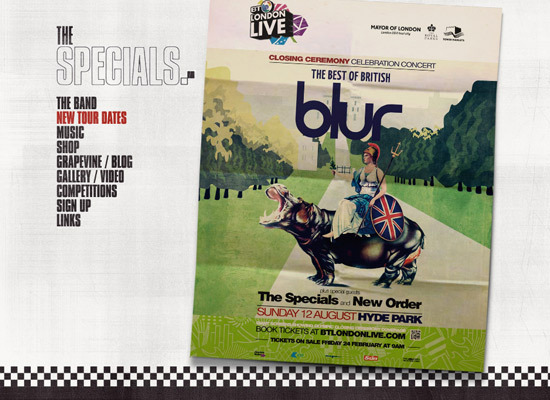 A simple, straightforwards design with a checkered pattern stripe at the bottom of the page is all this website for The Specials needs to get their music out there. The Specials blog has been maintained for three years, announcing upcoming events and giving a behind the scenes look at what it’s like to be Special. 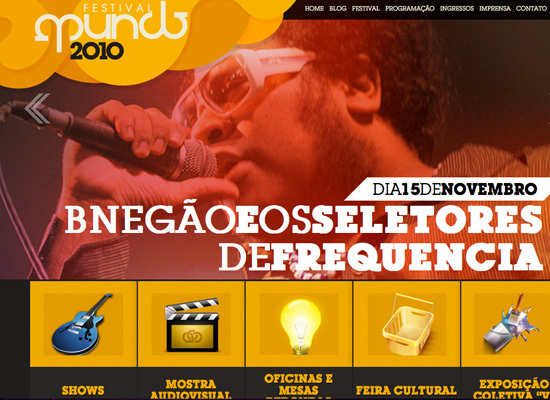 A splash of colors and bold, large scale typography make the website for Festival Mundo so striking. 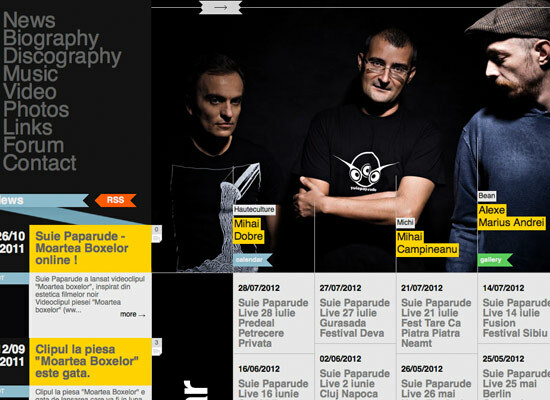 The use of large-scale photography is important for band and musician website, and it suggests the style of music before even listening to it. 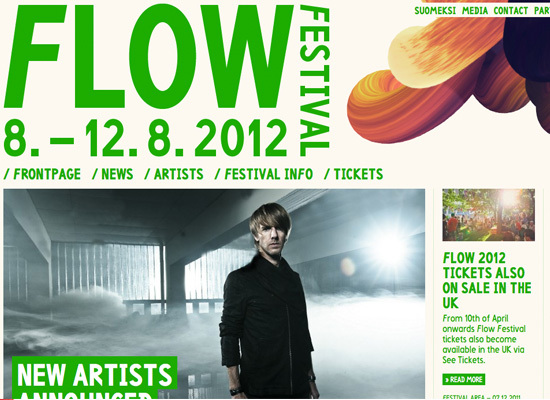 Again, the use of large-scale typography works on this music festivals website. The use of a single color for typography, green, also gives it a modern feel. Illustration, like photography, can set the tone and help suggest the style of music the artist produces. 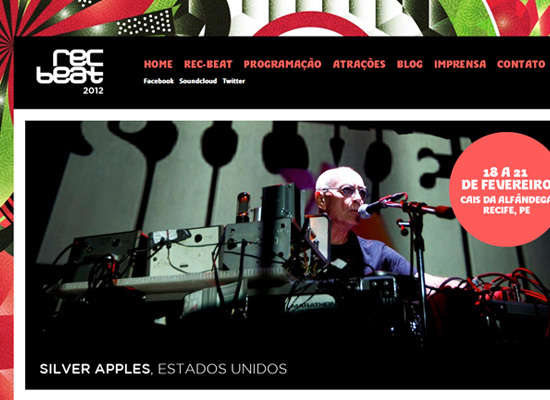 In this case, Rec Beat, a music festival in South America, uses bold, colorful imagery to reflect the culture of the musicians. Rec Beat does an outstanding job of using Facebook to keep fans of the festival engaged. A modern, progressive layout hints at the style of music of Suie Paparude. 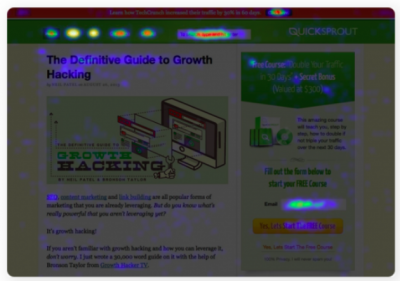 Large scale navigation is a common theme on grid-based websites, and is used successfully here. Tour dates are front and center and a link to a community forum allows fans to interact with each other and the band. 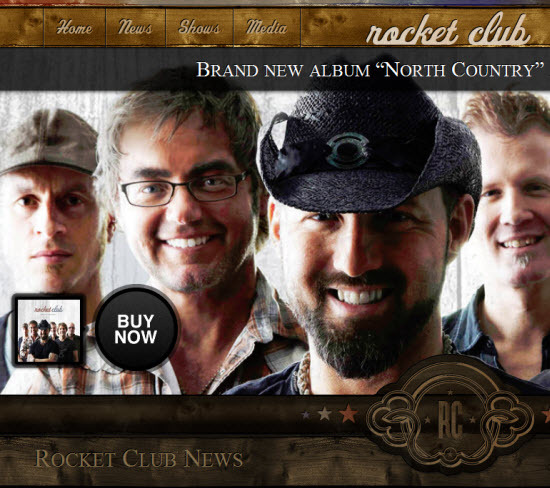 Rocket Club’s website has one thing on it’s mind — sell more of their new album “North Country.” This website does a great job of making the primary call-to-action to download the new album the focal point of the home page. 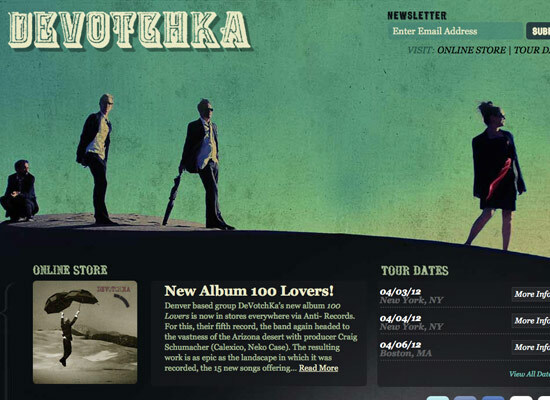 The information one would come to expect from an artists website is readily available on the homepage for Devotchka. Tour Dates, and with a link to the online store, make staying informed to the groups happenings easier. 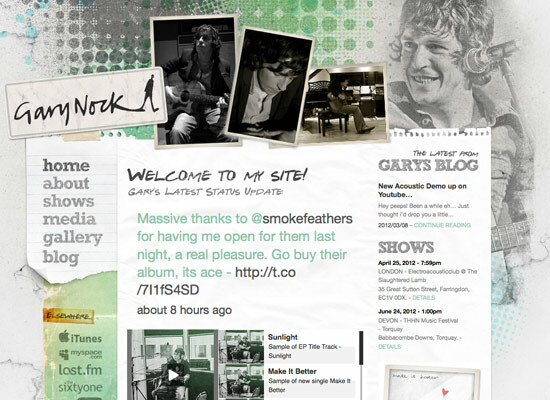 The collage is a popular trend in web design today, and is composed tastefully on the website for Gary Nock. Black and white photos, scraps of paper, and handwritten text add to this personal feel and reveal the artists personality. 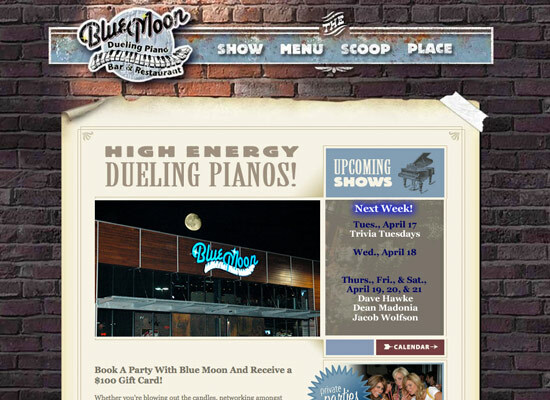 A full-scaled background adds the necessary texture to make this content pop on this website for a dueling piano bar. Notice how easy it is to find out date of upcoming shows. 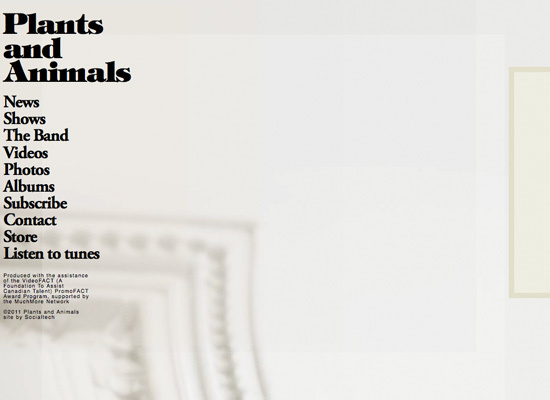 The use of texture in a website can really compliment the style of music by an artist. Dark, grungy textures work well for music that is loud and hard, such as this rock musician Brian Ray’s work. 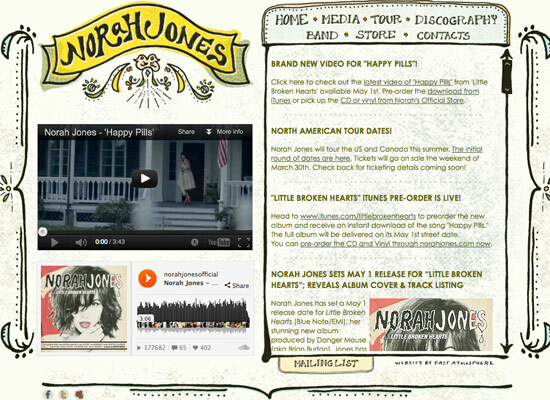 The hand-drawn, illustrated style of the Norah Jones website adds a vintage touch. Latest news is an important section to include on an established musician’s website, and is complimented well by her latest video to the left. 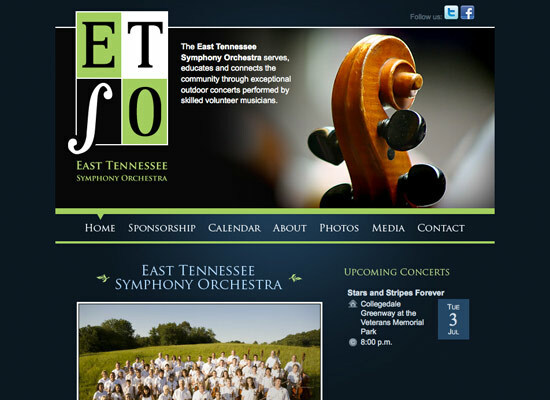 A large header image alluding to the theme of the website sets the stage for the East Tennessee Symphony Orchestra website. For a volunteer-run organization, this website serves as an elegant solution to informing visitors who they are and how they can get involved. 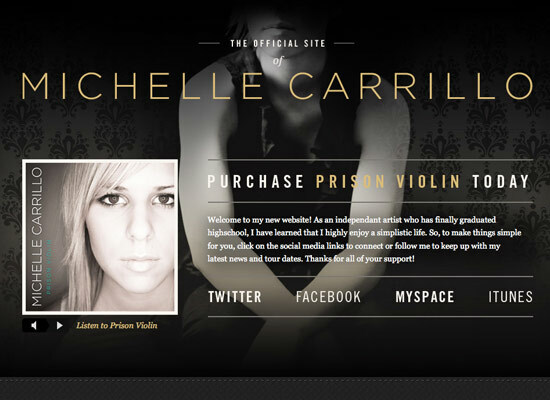 The call-to-action to purchase Michelle Carrillo’s latest is prominently displayed in the center of the site. A large, black and white self portrait sets the backdrop with prominent links to social networks that allow fans to stay informed of her career after browsing through the site. Editor’s Note (3/11/14): Michelle’s site doesn’t seem to be live any more, so the link was removed. 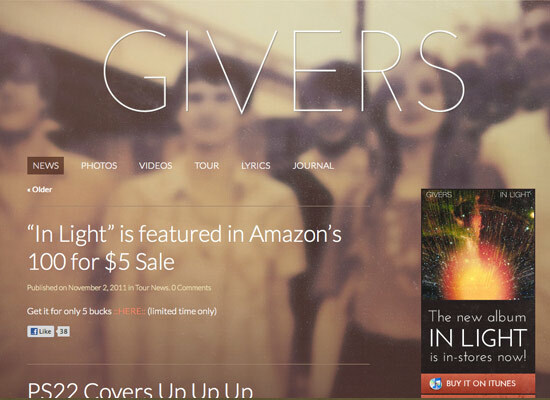 The Giver’s website is another example of how large-scale photography can add another dimension to a musicians website, while giving it a personal touch. These musician websites are not only visually stunning but also provide the information that fans need to stay engaged with the artist.